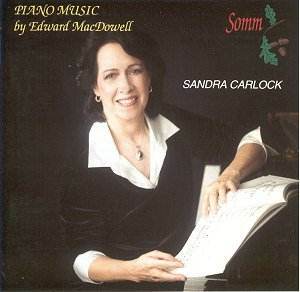 I hope this is the start of a MacDowell series from Sandra Carlock because she�s clearly a first class interpreter of his music. She avoids the temptation either to play up the grandiose inflation or to sentimentalise the quasi-impressionist withdrawal enshrined in these very different works. And that�s all to the good. With a warm sounding recording in St Philip�s in London we have a most attractive recital that takes in the bardic drama of the Arthurian Sonata Eroica as well as the more Francophile charms of the two pieces from the Fireside Tales � not to forget the academic sounding, but in fact thoroughly charming, Suite in E with its baroque sounding Praeludiums and Fugues. Fear not, they�re cut from a different cloth to the soon-to-burgeon neo-classicism. That cloth is distinctly Lisztian, of course, and we hear it immediately in that Praeludium. MacDowell feints toward a Bachian Presto but his musical heart leads him away and his central movement, a long Andantino and Allegretto is warmly enfolding and indeed unfolding � generous lyricism. This is a characterful and enjoyable piece, not especially plangent but with a somewhat Russian cast to the Rhapsodie - I kept thinking of Mussorgsky and Rachmaninov - and a triumphant conclusion to keep the salon patrons happy. Of the Fireside Tales the Fourth has its share of impressionist fireflies, the fifth its hints of Rachmaninov once more. I suppose the Sonata will be the best known work here, one that has garnered a reasonable crop of recordings over the years though many of them on smaller labels. Despite the big nobility of utterance she rightly cultivates there�s no undue forcing of tone in the opening movement; the dashing fugal section is negotiated with considerable control and when it�s interrupted by a fervent battle-cry there�s no incongruity at all. The elfish Listzian sprightliness of the as-good-as Scherzo is lightly done but the greatest weight of expectation surrounds the slow movement. Here Carlock terraces dynamics with acuity, the romantic trajectory is at all times keen and there�s plenty of space in her playing for the music to take its fullest, deepest measure. No less in the monumental finale with its heroism and death, where she proves a dynamic interpreter. As an envoi we are given the charmingly flowing morceaux that is the Étude de Concert � certainly a Lisztian show-off piece but played here with grace and elegance. A thoroughly recommendable disc then in which everything sounds just right � recording, playing, ethos. Will the other sonatas follow?